Moist. Deciduous and coniferous forests. Dappled sunlight to dense shade. This is a 4″ to 10″ tall, erect, perennial forb that rises on a single stem from a spreading, thread-like rhizome. The rhizome is ¾″ to 12″ long and 1 ⁄32″ to 1 ⁄16″ wide. Separate sterile and fertile stems are produced. 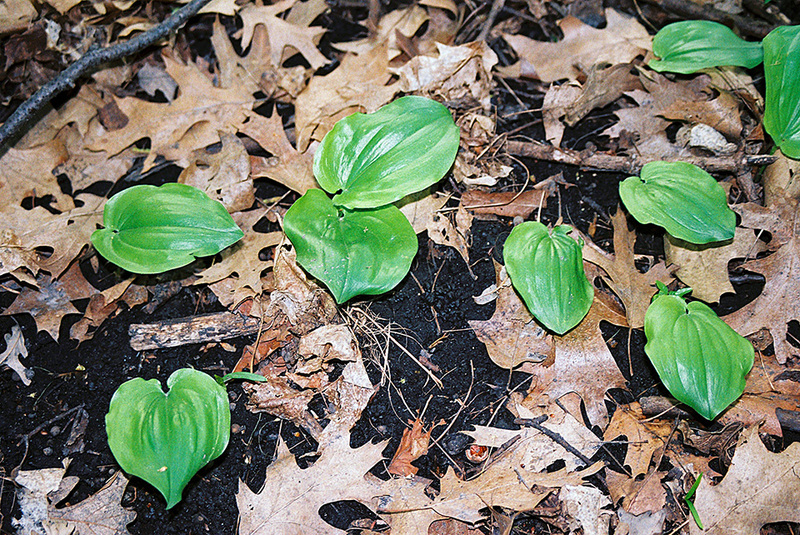 Sterile stems are short and have a single basal leaf. 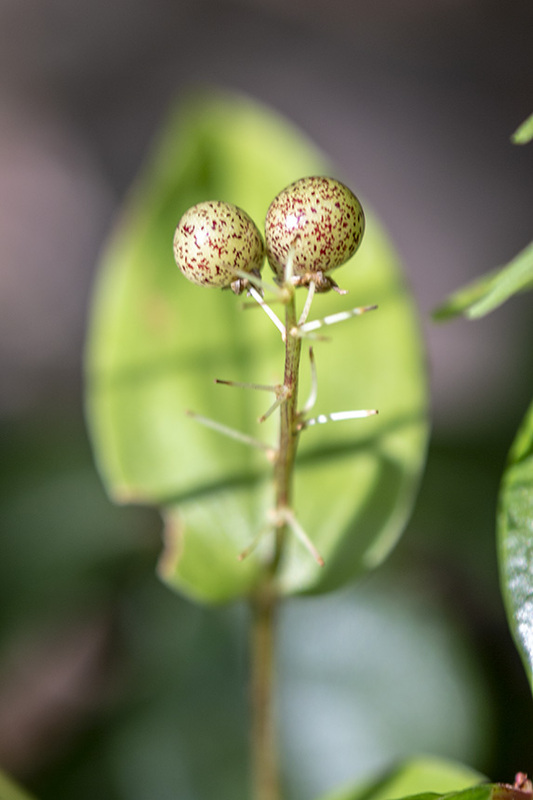 Fertile stems have usually 2, sometimes 3 leaves. They are erect, zigzagged, unbranched, round in cross section, hairless, 4″ to 7″ tall, and 1 ⁄32″ to ⅛″ in diameter. The basal leaf (on a sterile stem) is held parallel to the ground at maturity in a leaf stalk (petiole) that is up to 2″ long. The blade is egg-shaped, 1¾″ to 3¼″ long, and 1¼″ to 2¼″ wide. It is deeply heart-shaped with narrow sinuses at the base and tapers to a point at the tip with straight sides along the tip. Sometimes there is a short, tail-like appendage at the tip. There are usually 3, sometimes 5, conspicuous, recessed, parallel veins. The upper surface is medium green and hairless. 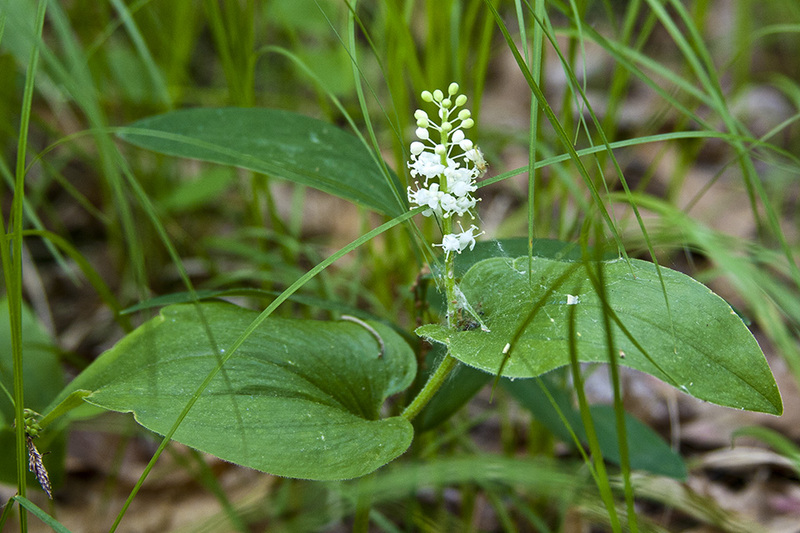 The lower surface is pale green and hairless or finely hairy. The margins are untoothed and sometimes have a fringe of fine hairs. 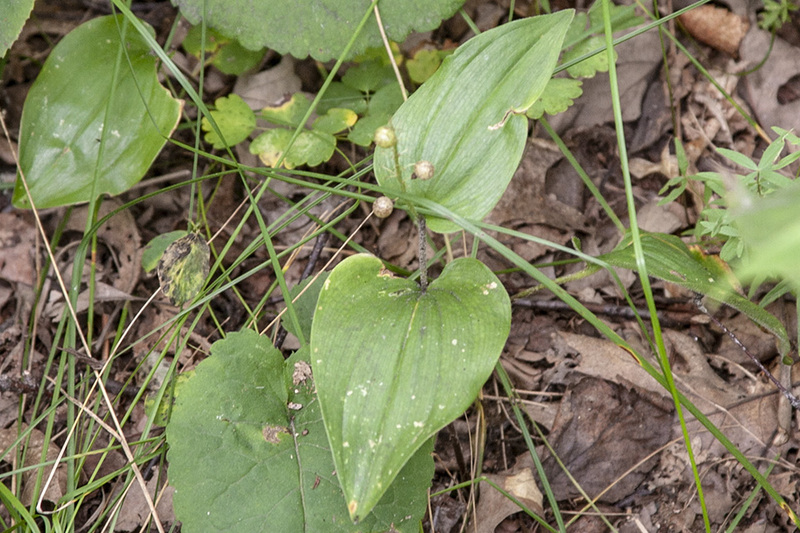 Leaves on the fertile stem are alternate. 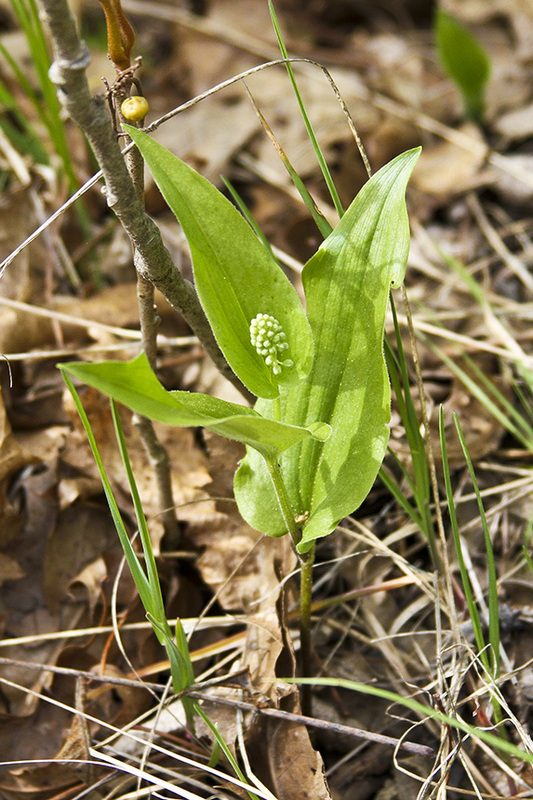 The lowest leaf is stalkless but otherwise similar to the basal leaf on a sterile stem. 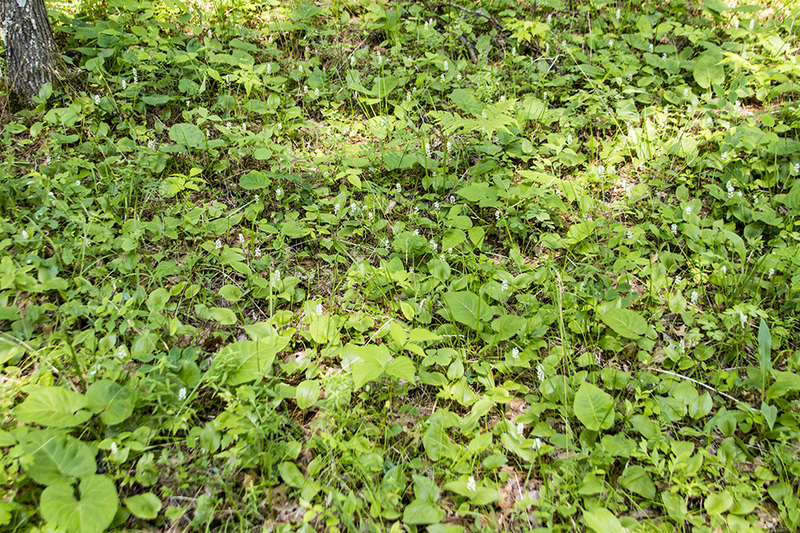 The uppermost leaf is on a short, 1 ⁄32″ to ¼″ long petiole and is often much narrower. 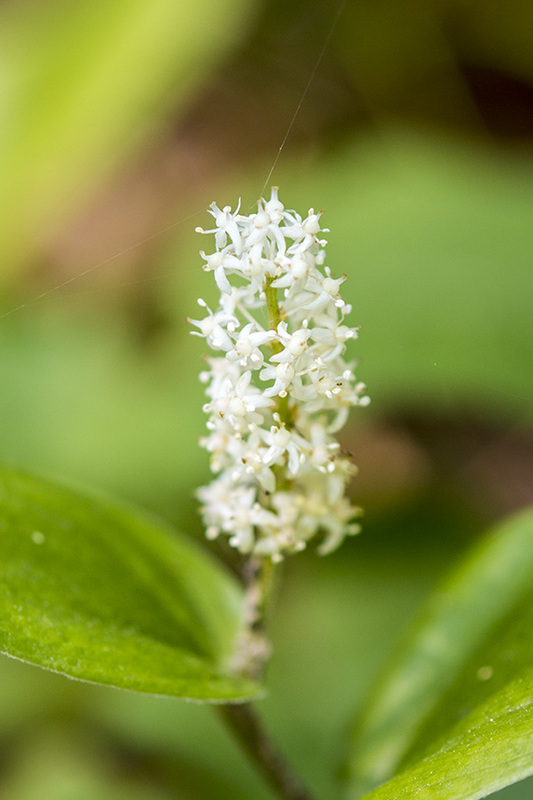 The inflorescence is a plume-like, unbranched cluster (raceme) of 12 to 24 tiny flowers at the end of the stem. The raceme is cylinder-shaped, erect, and ¾″ to 2″ long. 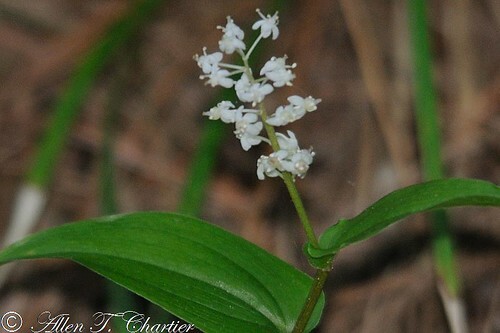 There are usually 2 flowers, sometimes 1 or 3, at each node of the raceme. Each flower is star-shaped and about ⅜″ wide. There are 2 petals, 2 similar, petal-like sepals (4 tepals), and 4 stamens. The tepals are conspicuous, white, 1 ⁄32″to 1⁄16″ long, and 1 ⁄32″to ⅛″ wide. The stamens have white filaments and yellow anthers. They are 1 ⁄32″ to 1⁄16″ long and protrude well beyond the petals. The fruit is a globular, ⅛″ to ¼″ in diameter berry with 1 or 2 seeds. It is initially green mottled with red, becoming deep translucent red when ripe. 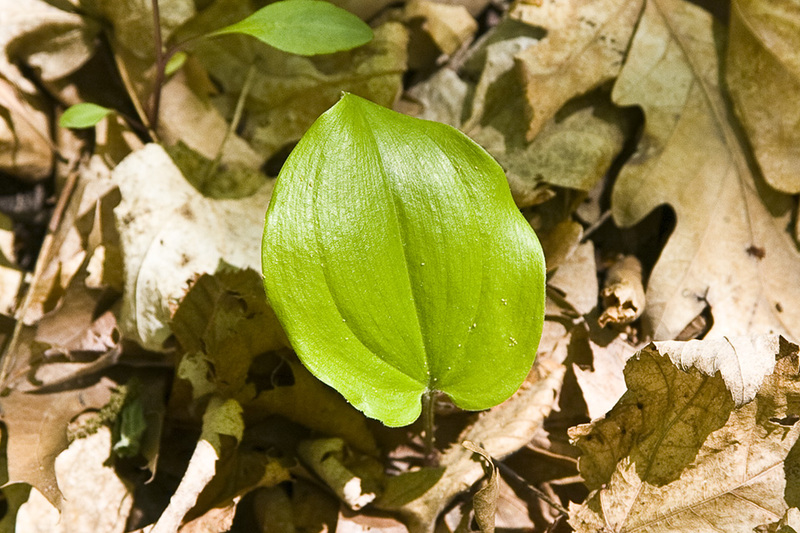 Plants in the eastern half of its range have a hairless lower leaf surface and a hairless margin. Plants in the west have larger leaves with a finely hairy lower leaf surface and a fringe of fine hairs on the leaf margin. 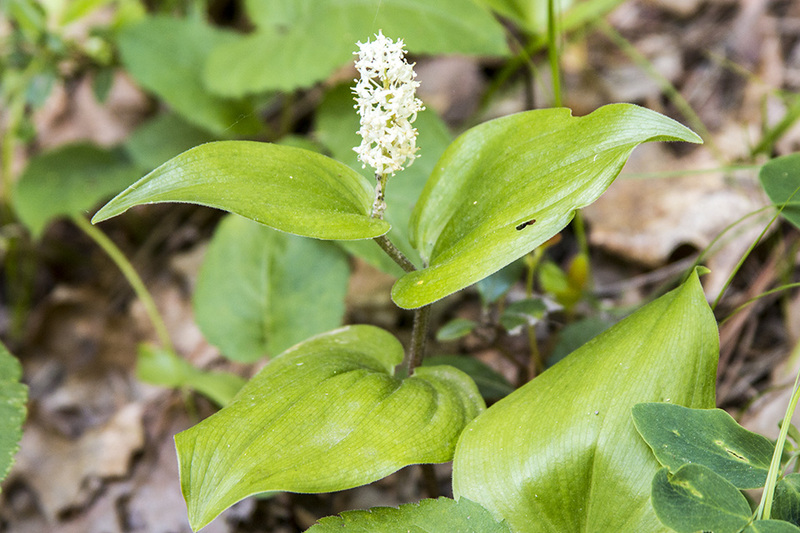 Some authorities, including Gleason & Cronquist41 and Voss43, distinguish the latter as a separate variety, Maianthemum canadense var. 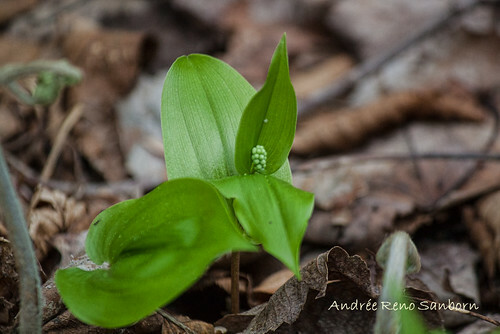 interius, and the former as Maianthemum canadense var. canadense. Neither GRIN38 nor ITIS37 recognize the varieties. 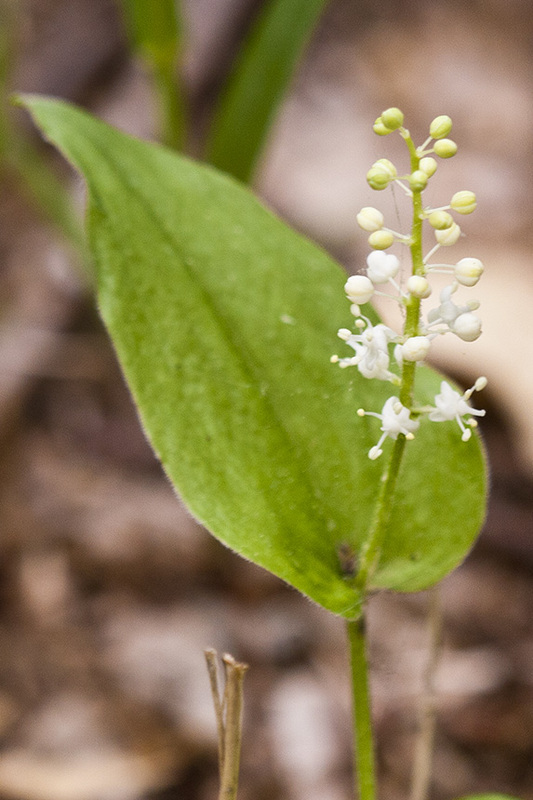 New England Wild Flower Society Stockbed Grower Dan Jaffe talks about one of his favorite plants - Maianthemum canadense.